"Happiness Helps Healing- providing entertainment to sick children in hospitals"
Smiling Hospital Foundation India was yet again at its mission of spreading happiness. This time it was at Max Cancer Centre, Max Healthcare, at their event , “Rendezvous with Yourself” on the 22nd of March, 2012 for cancer survivors. Max Cancer Centre is a comprehensive cancer care centre, providing holistic care for its patients.“Back to Life” is how their experts visualize and define cancer care. Therefore, the underlying principle of holding such an event was to help them rejoice and infuse ‘that’ spark to live in them. The survivors ranged from 5-15 years of age and were too happy to be a part of the event . Their smiles and the zest to live life rubbed on to all present . 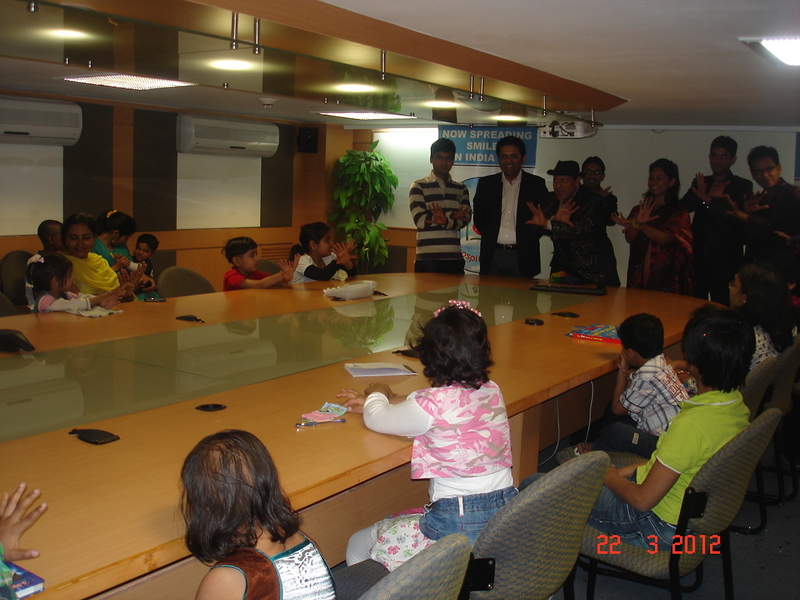 Smiling Hospital Foundation India was yet again at its mission of spreading happiness. 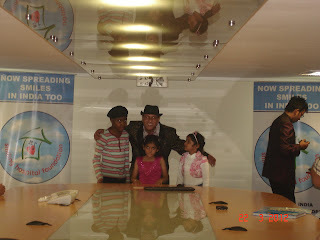 This time it was at Max Cancer Centre, Max Healthcare, at their event , “Rendezvous with Yourself” on the 22nd of March, 2012 for cancer survivors. Max Cancer Centre is a comprehensive cancer care centre, providing holistic care for its patients.“Back to Life” is how their experts visualize and define cancer care. Therefore, the underlying principle of holding such an event was to help them rejoice and infuse ‘that’ spark to live in them. The survivors ranged from 5-15 years of age and were too happy to be a part of the event . Their smiles and the zest to live life rubbed on to all present in the show. 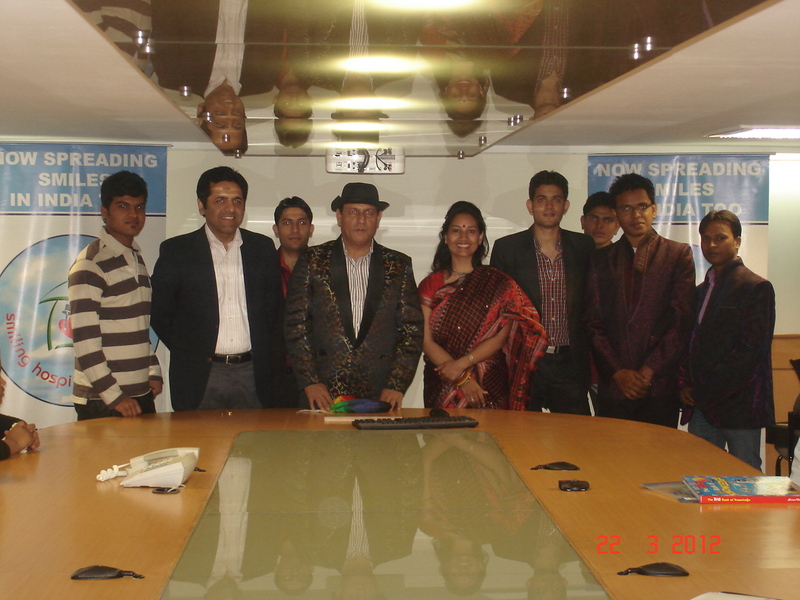 Earlier this month, your organisation- Smiling Hospital India, had a very pleasant and moving experience. It was during the activity at Safdarjung Hospital, New Delhi. I was moved to the hilt. Ditto my fellow volunteers, as we went from bed to bed in the children's ward. Suffering was in the face. With me was the team of magicians led by famous conjurer Raj Kumar and fellow volunteer Anup Kalra. As we moved through the wards it became clear, suffering or not, children are children. The faces of children like Karani and Rani (names changed) being treated in the hospital are still fresh with me. As Magician Raj Kumar and his team showed tricks, there was giggles and laughters all around. Exactly something your organisation wants to do. Rani laughed the loudest. I am attaching some pictures, hope you enjoy looking and would join us the next time. Smiling Hospital Foundation India is part of an international network of Smiling Hospital Foundations with members in China, Croatia, Hungary, India, Indonesia, Singapore, Slovakia and Slovenia. We seek to work with children who are sick and in hospitals and miss being children. This means organising magic shows, story telling sessions and much more. Some pictures from one of our events at a cancer hospital in New Delhi.